A dry spread application fertiliser that provides nitrogen and sulphur. After application the granule dissolves easily for rapid plant uptake. Quick-N is ideally suited to supply the nutritional requirements of vegetables, fruits, vines, turf, pasture, broad acre and forage crops. Sulphur is essential for chlorophyll formation and therefore photosynthesis. Quick-N supplies sulphur as readily available sulphate. Campbells Quick-N is suitable for use in vegetables, fruit, vines, cereal, pasture and fodder crops. Compared to urea, Quick-N provides more readily available nitrogen over a range of climatic conditions with no volatilisation. As the name suggests, Quick-N provides readily available nitrate nitrogen for rapid uptake and utilisation followed by sustained ammonium availability. The presence of sulphur ensures efficient nitrogen utilisation within the plant. Quick-N does not contain harmful chloride or heavy metals. It doesn’t contain urea, thus minimising nitrogen losses into the atmosphere. Quick-N granule size is a homogenous for even distribution of nutrients and highly soluble. 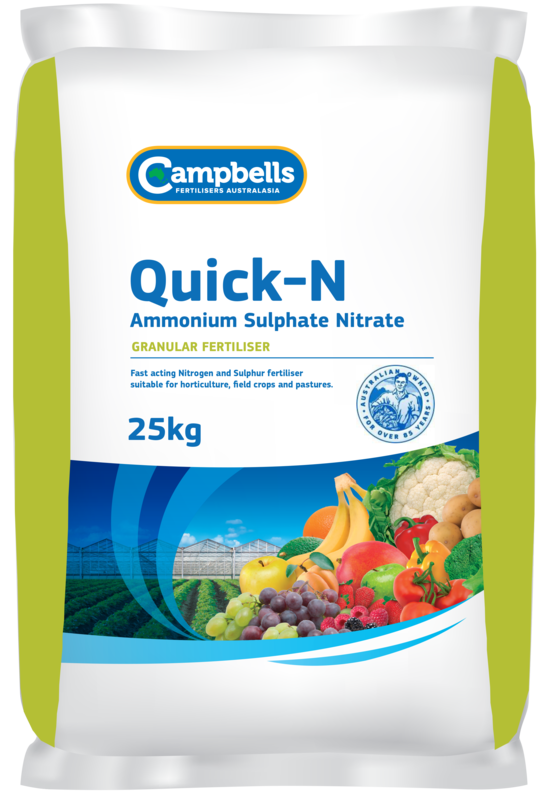 Campbells Quick-N can be a major nitrogen source in a fertiliser program or strategically used at specific times in the development of crops, in conjunction with other fertilisers. Quick-N is developed for broadcast or top dressing application. It is a non-dusting, free flowing product that can be applied as a band or broadcast. General rates for horticultural crops are between 100-200 kg/ha in a single application. The actual rates, number of applications and their timing will vary considerably for different crops and for different districts. Before application, seek advice from your Campbell’s Quick-N distributor or your local agronomist.